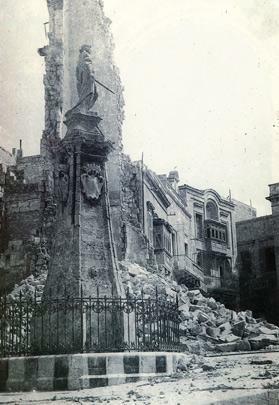 Vittoriosa’s medieval watch tower, a six-floored structure that had dominated the city’s piazza long before the coming of the Knights in 1530, was partially destroyed in the Luftwaffe’s brutal attacks in 1942. It was an iconic symbol of resistance that had witnessed Malta’s history unfold through the ages. It embodied Vittoriosa’s resistance in the bitter struggle in 1565 when the Knights and the city’s population defiantly and bravely faced the might of the Ottoman power. This momentous event was explained in the evocative inscription on the tower penned by the erudite Vincent Frendo Azzopardi in 1921. Questa torre onde al popolo acclamante giunse nel Grande Assedio del 1565 l’appello del Duce la Vallete vide maturare nei petti dei Cavalieri e dei Maltesi la resistenza ai traci e borgo surto dal sangue chiamarsi città Vittoriosa. The Victory Monument standing defiantly in front of the ruins of the clock tower after it was destroyed during a German blitz on April 4, 1942. 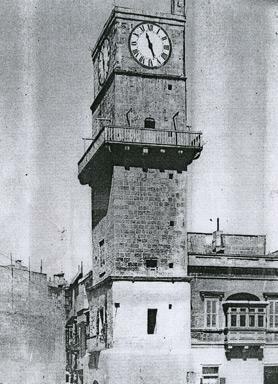 Fully conscious of the old tower’s significance to the history of our island home, on December 19, 1954, the Historical and Cultural Society of Vittoriosa convened an extraordinary general meeting, which carried with acclamation an urgent motion to request the government to take immediate action for its rebuilding. Almost 60 years have passed since then, and after some more feeble attempts at its rebuilding, the historic Vittoriosa piazza is still without its medieval tower. Besides its historical aspects, this article is an endorsement of the passionate appeal by Vittoriosa mayor John Boxall, inspired by the old Vittoriosa spirit, to reclaim the past, as most major cities in Europe have done during the past 60 years. From an architectural point of view, it must be emphasised that whoever designed this historic tower, well before the coming of the Knights, must have been personally familiar with the flowering of the Italian Renaissance. Undoubtedly, it strengthens Vittoriosa’s claim to its European roots and ethos embodied in its early buildings, like the Castellania palace, its magnificent Porta Maggiore (Main Gate) and the edifices on the processional route. The ancient city of Vittoriosa is a national icon, and all history lovers should join in the national chorus for the rebuilding of the medieval watch tower. While preparing this article, I consulted the erudite contribution by the late Can. Anton Zammit Gabaretta in the Armed Forces of Malta Journal (1977). He brilliantly visualises the iconic Piazza San Marco in Venice, the most visited square in the world. He reveals that in 1902, the old medieval tower, for long the most painted item by the Venetian painters, suddenly collapsed, only to be rebuilt a couple of years later by the skilled artisans of Venice. It is interesting to note that an English newspaper in 1943 suggested to the War Office in London that reconstruction in Malta’s historic cities should be entrusted exclusively to Italian labour. The reason why this lofty watch tower was erected in the middle of the historic piazza, strategically sited at the end of the processional route starting from Porta Maggiore, has not yet been satisfactorily explained. 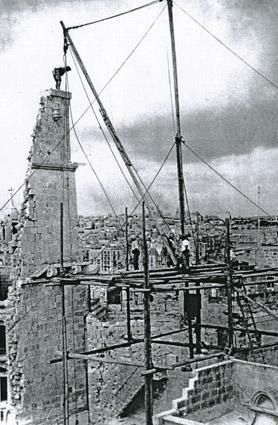 The remains of the ancient tower being demolished in 1949 in very risky conditions. Note the man standing dangerously on the top. This main street bisected the town into two sections: on one side there was the Collachio, where all the auberges, except the Italian one, and main buildings were located, and the other section was mainly inhabited by the local populace. This processional thoroughfare was lined with some important buildings, such as the Greek church of St George, the Dominican church of the Annunciation (Il-Lunzjata) and the Castellania palace on the site of the Inquisitor’s Palace; on the land-front it was guarded by the two lofty cavaliers of St John and St James. That the siting of such a lofty, massive watch tower was in the main piazza, when normally such a prestigious location was reserved for a church, can be ascribed to defence considerations. Until 1571, when the Order of St John moved its seat to the new city of Valletta, Vittoriosa was the only settlement facing the sea, and in spite of the protection given by the Castrum Maris (castle by the sea), it was frequently exposed to various incursions by the Barbary pirates. Thus, a watch tower that could command a view of the surrounding sea and the countryside was absolutely essential. A recent photo montage of the historic tower. The late 15th and early 16th centuries were characterised by frequent razzias in the Vittoriosa countryside and nearby hamlets, particularly at Żejtun. 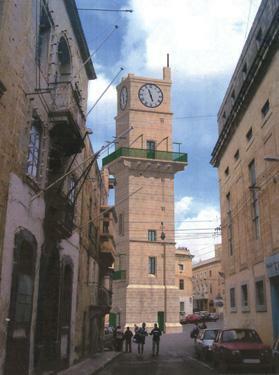 In many instances, the villagers were unable to reach the safety of the Castrum Maris as the Żejtun and Tarxien Dejmas (militia) were late in raising the alarm. In order to give advance warning, a bigger alarm bell, made in the renowned Messina foundry of Carbuni in 1504 and paid by the city elders, was hoisted on the 93-foot-high tower with the following inscription crudely etched on its flanks: Evantunellu Carbuni me fecit nobili civitati Messanae MCCCCCIIII. The Vittoriosa watch tower is an architectural gem that deserves to be studied in detail, especially in view of our claim of early European sophistication at a time when, with the exception of Mdina, the rest of the island looked more Arabic than European. It was definitely an imposing structure, rising squarely to over six storeys punctuated by Siculo-Norman architecture and an impressive balcony that encircled the upper part of the tower. Later, the Knights placed their coat of arms on the top façade. In 1549, they also etched on its sides four huge, eight-pointed crosses which the ravages of time removed before the tower was sliced in two during the German blitz of 1942. Throughout the Great Siege of 1565, the tower and its piazza were the most famous buildings in Christendom, as the Siege maps, issued in most European cities, some of which are in the possession of Heritage Malta, clearly indicate. In 1629, during the reign of Grand Master Antoine de Paule, a large clock was placed on the front of the tower as well as an additional bell to accompany the Carbuni one. A marble plaque on the tower recorded this event occurring when Captain Alexander de Warax of the Langue of Auvergne was governor of Vittoriosa together with other members of the Civil Administration, namely Giovanni Mallia, G. Testaferrata, M. Cristoforo and L. Burlo, treasurer of the administration. Particularly during the Knights’ period, the clock tower was supervised by various keepers who daily scaled over 100 steps to ensure that the clock was in perfect working order. At the National Library in Valletta one finds all the records pertaining to the upkeep of this historic clock tower. I have heard many legends that originated at the foot of this massive tower, some laced with a touch of humour, others sordid and scary as, like in The Phantom of the Opera, the resident ghost retold its weird stories in the presence of the old Carbuni bell. If the Carbuni bell could speak, which experience would it regale us with? Would it tell us about the burning at the stake of the Augustinian monk Fra Francesco Gesualdo in the middle of the piazza for his Lutheran beliefs? Would it tell us about Grand Master Jean de Valette’s daily surveillance from the top of the tower or his morning briefing to the troops at the foot of the tower, the daily mustering point, as meticulously recorded in the Diary of the Siege by Francisco Balbi di Correggio? Perhaps the historic bell would describe the provocative and significant ceremony of the raising of the Pole of Liberty in the centre of the piazza on August 10, 1798, a highly religious day for Vittoriosa, with speeches by Claude Henri Belgrand de Vaubois, Michel Louis Étienne Regnaud de Saint-Jean d’Angély and Andrew Willoughby Ninian Bertie? Novelists visualise other scenarios in the shadow of the tower. Tim Willocks, author of The Religion, gives us de Valette’s savage reaction after witnessing from Fort St Angelo the macabre scenes of headless knights and Maltese lashed or nailed to crosses floating in the middle of the harbour after the fall of St Elmo on June 24, 1565. The fact that this mighty watch tower and its piazza steeped in history were featured so prominently in the Siege maps, issued in the major cities of Europe in 1565, is an indication of their importance. Dr Buttigieg’s children still patiently and longingly wait in the pious hope that the watch tower bells will chime again.